We will complete our initial look at relativity theory by examining Einstein’s time function. Defined in §3 of his 1905 paper, this function is named τ, or Tau. In this Tutorial, we will use the Greek letter τ and its written name Tau interchangeably. As mentioned in earlier Tutorials, don’t let the use of the Greek letter deter you. It is just one of the letters Einstein chose to use in his work. Examination of Equation 2 should lead to an obvious and reasonable conclusion that vx’ / (c2 – v2) is an adjustment to time, because it is subtracted from the time variable t. It follows that τ must be the adjusted time variable. The degree to which this explanation seems perfectly reasonable is only matched in magnitude by the degree to which this explanation is entirely wrong. What you will read next should not make sense to readers who do not understand the subtleties of functions: Equation 2 is not an equation, τ is not a variable, and the t variable is not the t variable. For readers with a foundation in functions, this sentence is clarified by restating it as: Equation 2 is not an equation, it is a function definition; τ is not a variable, it is the function name; and the local t variable is not the same as the global t variable. The meaning of this revised sentence will become more apparent later in this Tutorial when we rewrite the τ function using modern notation. But first, we have to introduce the key concepts and ideas that distinguish functions from equations. Functions are an important mathematical tool. Introduced in algebra or calculus, functions are thoroughly developed in computer science where they are extensively used in modern programming. One of the most important concepts associated with functions is called a namespace. To explain how functions differ from equations, we must examine how namespaces work. Every student must be in a specific space, either in a room or on the playground. Every student in each space (eg, room or playground) must have a unique first name. Multiple students at the school can have the same name, as long as they are in different rooms or locations. If a student is explicitly assigned to a room, he will never go to the playground or to another classroom. Students are implicitly assigned to be on the playground unless explicitly assigned to a room. Students on the playground can enter and exit rooms as long as there isn’t another student in the room with the same name. Teachers can only call on students who are in their room or who are on the playground (eg, a teacher cannot call on a student who is assigned to another teacher’s room). If a student in a room has the same name as a student on the playground and the teacher calls that student’s name, then the student in the room will always respond. If no student in the room has the name the teacher has called, then the student on the playground with that name will respond. Now imagine the following scenario: Xander, Yasmin, Zack, and Tom are on the playground. Because they are on the playground, any teacher can call on any of them to ask for their help grading papers. Notice that any or all students on the playground can be called on by any teacher in the school. The fact that every student is on the playground implies that every student will have a unique first name. Of course, in mathematics, we use slightly different terminology than teachers, students, and playgrounds. Instead of teachers, we have mathematical statements, or equations. Instead of a playground we have the global namespace. And instead of students like Xander, Yasmin, Zack, and Tom, we have global variables like x, y, z, and t. Conceptually, this is how equations work in mathematics – every variable is available to every equation at any time. The placement of the student’s name between the parentheses following the room name, a notation called the signature, explicitly assigns him to the math class. This placement distinguishes him from the other student named Tom who is on the playground. Because the school now has two students named Tom, we will say that this name is overloaded. Notice that when the math teacher calls on Xander, he is calling on the student on the playground, because there is only one student named Xander and he is on the playground. However, when the math teacher calls on Tom, it is the Tom who is assigned to the math class who will respond, not Tom on the playground and not Tom who is in the English room. Carrying this example further, if the physics teacher were to call on Tom, it would be Tom from the playground who will respond. Remember, the physics teacher cannot call on a student from the math or the English class. Recognizing which student you are referring to is a lot more complicated when their name is overloaded. Imagine the confusion that might ensue if the physics teacher and the math teacher meet over lunch to discuss Tom’s grade. If they aren’t careful, they might not realize that they are talking about two different students. Functions share many similarities with the second scenario, where names might be overloaded. Similar to the first scenario, we still have global namespace, global variables and mathematical equations. To this we add characteristics that are specific to functions. Instead of rooms, functions use local namespaces. Rather than students explicitly assigned to a room, functions use local variables in local namespaces. 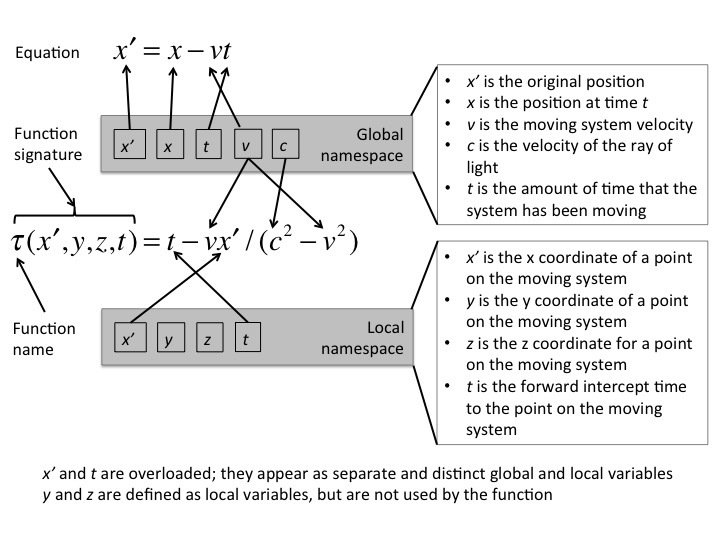 For example, Tom is a “local variable” in the math “namespace” and another Tom is a different “local variable” in the English “namespace.” Although they have the same name, they are different variables, and neither should be confused with Tom who is in the global namespace (eg, playground). Functions create and use namespaces and local variables through a two–step process called: function definition and function invocation. Although critical to understanding how functions work, we will not discuss function invocation in this Tutorial. However, it’s important to understand that it is this two–step process that give functions the power to create and use namespaces. 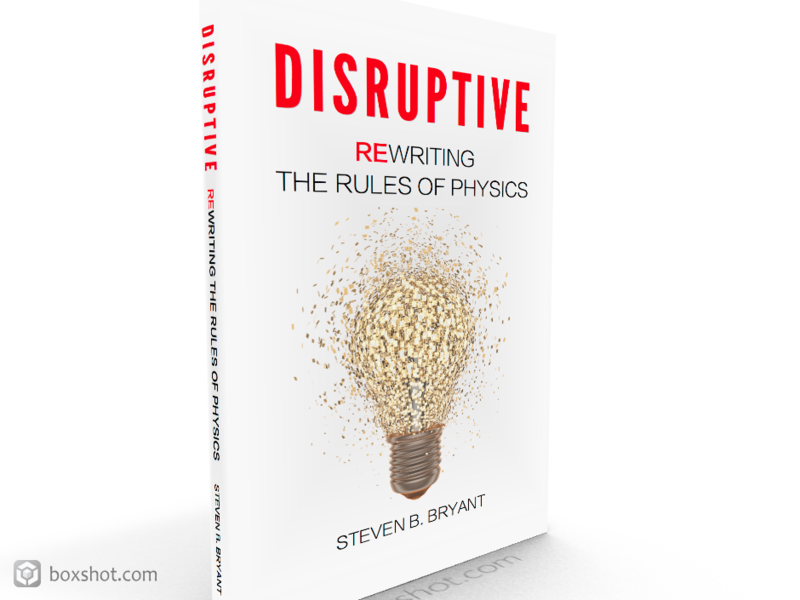 Because functions are so important, they are examined in detail in Chapter 5 of DISRUPTIVE. Now that we have explained the essential idea of namespaces, we can examine how Einstein treats τ in his work. This is an equation, where each variable is a global variable that is in the global namespace. In other words, in Equation 1 the variables x’ and t are global variables. Notice that x and v are also global variables, but they are not the focus of our attention. As mentioned above, all variables associated with equations are global variables that are located in the global namespace (eg, they are all students on the playground). When the τ function is written in this way, you will mistreat it as if it were an equation. In doing so, you will treat each variable as if it were a global variable in the global namespace. Specifically, this means that the x’ and t variables in Equation 2 would be the same ones that are used in Equation 1. Conceptually, Einstein mistreats τ like an equation in his work. He presumes that all of the variables are in the playground. This is a mistake, because this is not how functions work. Function 1 is a function definition, where τ(x’, y, z, t) is called the function signature and t – vx’ / (c2 – v2) is called the function body. As a technicality, a function definition cannot be used as an equation prior to its function invocation. Remember, functions require two steps before they can be used. Notice that τ is not a variable: It is the function’s name. Similar to the assignment of Tom to the math and English classes, the function signature creates four local variables: x’, y, z, and t. The local variables x’ and t are overloaded. They are distinct from the global variables of the same name used in Equation 1. The y and z local variables are not used in the function body and can be safely ignored. Function definitions differ from equations in two critically important ways. First, as mentioned above, functions must always be invoked before they can be used. Second, you cannot set a local variable through assignment or substitution; local variables can only be set during function invocation. This means that Einstein’s statement “substituting x’ with its value” is a mathematical mistake. This leads to a second and more critical mistake, which is the simplification of the function definition as if it were an equation. Einstein’s mistreatment of the τ function as an equation leads to conceptual confusion of time in modern physics. It is only through a proper understanding of functions and an understanding of the subtraction mean equation that we can discern what τ does. Tau uses the subtraction mean equation to find the average intercept time; it is not an adjustment to the global time variable t. This corrected understanding will have profound implications on the meaning of time and its treatment in modern physics. The τ function is one of the most misunderstood aspect of Einstein’s work. In this Tutorial, we have examined subtle and critically important differences that distinguish functions from equations. Tau is not an adjusted time variable, it is a function that produces the average intercept time to a point in the moving system. It is separate and distinct from the global variable t, which represents the amount of time that the moving system has been in motion. This proper understanding of functions not only demystifies Einstein’s τ function, it removes the confusion associated with the meaning of time in modern physics. ⟵Tutorial Fourteen – Length contraction, time dilation, and why relativity requires both!